Describing herself as a “Paintings Writer”, Gukzik’s recent artistic interest is in juxtaposing words and images, which is different from the style of her earlier printmaking works. Her works are literally contemplations of some universal questions. “Green is one of the universal values, and its meaning is more than environmental protection. When you have a firm believe, or a deep concern for the human beings, naturally you would want to let people know about it. Exhibiting the work outdoor is as if I am saying my belief out loud,” says the artist. 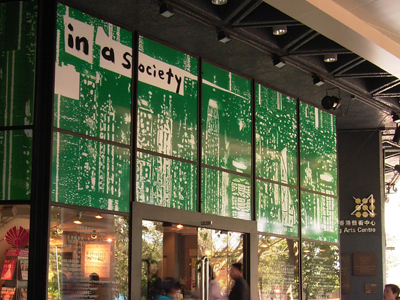 A Society That Is Yet To Become Green is her largest public art piece. 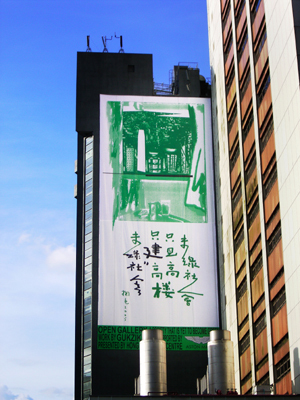 Louis Yu, Executive Director of the Arts Centre, expresses that it is good to have more public art pieces in the city: “Most of the buildings’ exterior walls have become advertising spaces in an economic city like Hong Kong. But we want to tailor-made an artwork for the precious wall space. People usually see paintings in galleries or exhibition halls. It would be interesting when you are driving on the busy Gloucester Road and see such a big outdoor art piece,” says Mr Yu. This is the first time that the Arts Centre uses its exterior wall as an exhibition space, known as the Open Gallery, with an aim to bring public art closer to the public. 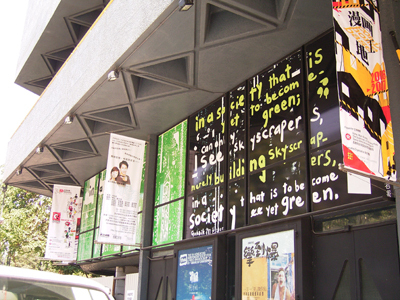 The Open Gallery is the only and the biggest outdoor exhibition space in Hong Kong.